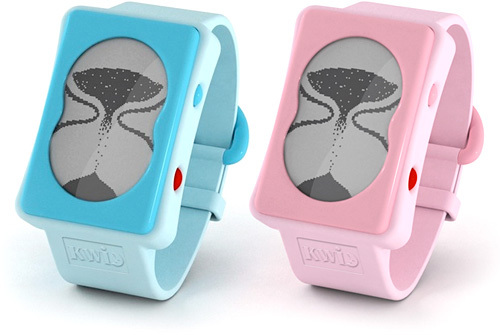 KWID Hourglass Watch Helps Kids Learn Time | OhGizmo! Kids rarely have a good comprehension of time. Like when you tell them it’s still another two hours to grandma’s house, and ten minutes later they’re asking “are we there yet?” So the KWID watch features a unique digital hourglass LCD that provides a more visual and easily understandable representation of just how long a given amount of time really is. So when you tell them they can play outside for five more minutes, they’ll see just exactly how quickly the minutes will disappear. The KWID watch also has a traditional clock face mode with the time displayed as numbers beneath it helping kids learn how to read the hour and minute hands, and various playful animations that make learning more enjoyable. It’s also ~$37 (£22.95) from Baby Sleep Shop which might actually be a bit on the expensive side given how ‘well’ kids take care of their things. I know from experience that if given a digital clock next to an analog one kids will never learn how to read a clock face. Sure, they will learn where the numbers are and understand the theory, but I grew up with digital clocks and even now it takes me a good minute or so of interpretation and calculation in order to extract the time from an analog clock. I can only assume that it is a matter of practice, since many people can glance at an analog clock (even one without any numbers) and immediately know the time, but in today's world the majority of clocks and watches are digital. Still, this is a neat idea, and although a simple stopwatch would serve the same purpose I can see how an hourglass would do a better job giving an impression of the passing of time.